Dense fog shrouded the doe trail. The air smelled thick, humid, and almost sweet, like drying corn. Water pattered down from tall oaks and short witch hazel bushes. Elk moccasins splashed the night before’s raindrops that clung to sparse, pale-green blades of prairie grass. The course progressed right, then uphill. Thread-bare, rust-colored silk ribbons hand-stitched to the leggin flaps told of trail-worn wool damped to the garters. A dozen paces back an inadvertent brush against a red cedar tree’s drooping bough wet a ruffled shirt sleeve. The moisture felt warm. Despite the minor inconveniences, it was a magnificent day, deep in the Old Northwest Territory, three ridges east of the River Raisin, in the Year of our Lord, 1796. The song birds made nary a twitter or peep. Thirty paces up the knoll, the doe path veered to the west, passing between two modest cedar trees with branch-tips a trade-gun-length-and-a-half apart. 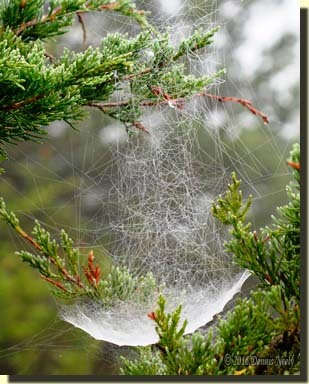 A perfect spider’s web, each strand lined with tiny silver beads, stretched across the path, extending from shoulders to ankles on a humble returned captive. A long pause failed to reveal the maker’s whereabouts. The elk moccasins circled the north tree, avoided another beside it, then returned to the gravel path. A dozen trees distant, a web of a different sort, spun at eye level in a wispy cedar bough, became the object of my concentration. This spider’s abode seemed to have two traps, a dense, silky weave that lay parallel to the ground and a hodgepodge of strands above. The clinging silvery pearls weighed down the former, distorting it into a dished shape. As I examined the contrivance from different angles, the morning’s soft light changed the shape; viewed from the north, the oddity looked similar to a schooner that I once saw from the bank of Lake Huron. Lingering was not that sojourn’s intent, rather, soaked elk moccasins pressed on down the hill to the edge of the big swamp, arriving at the clump of cedar trees north of the narrows. The oaks on the south island appeared as misty gray shapes in the thick fog. Three crows flew from the thin cloud, but never uttered a sound. A blue jay’s rapid wing beats whooshed overhead. I did not move, so I expected no alarm. At the doe trail’s gentle bend, three dead trees, all with the girth of a five-gallon rum keg, lay sprawled down the hill. The tops reached to the swamp’s sedge-grass edge. A clear path skirted around the obstructions. I followed that forest route, wishing to explore farther. An overnight rainstorm and a brief break in this summer’s oppressing heat and humidity offered an opportunity for a 1790 scout. Stepping over time’s threshold took little effort; unbeknownst to me, my mind longed for a change of century. The ceremonial drenching was but a minor irritation. Depending upon circumstance and my concern for personal safety, I rarely don hunter orange on these off-season jaunts, east of the River Raisin in the Old Northwest Territory. I tend to describe such forays as “scouts,” rather than “still-hunts.” The technique for traversing the forest and fen is the same, but the intent is not to take game. 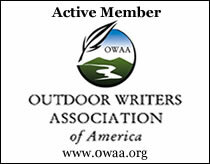 Further, I do not charge “Old Turkey Feathers” and often do not carry shot or round ball in my Odawa-style shot pouch. On several occasions this has proven to be a mistake, the most notable when a coyote stalked along the lower path as I rested cross-legged against a cedar tree just off of the south island. The coyote growled, then dashed uphill. The historical me converted the beast to a wolf, in keeping with local settlement-period writings. But in a 21st-century sense, coyotes were in season on that day. Coyotes were, and are destroying our small game species, and of late have turned to running down the younger deer and fawns. I found four such kills in March alone. At any rate, I came away from that encounter disappointed that I missed an opportunity. The concept of measured compromise dictates that a living historian must weigh, or measure, the impact of a 21st-century intrusion and apply a solution, or compromise, that minimizes the impact of that intrusion on an 18th-century time-traveling adventure. Thus, instead of wearing hunter orange and carrying a base hunting license, I chose to travel with an unloaded trade gun. Strike out on a summer scout, be safe and may God bless you. 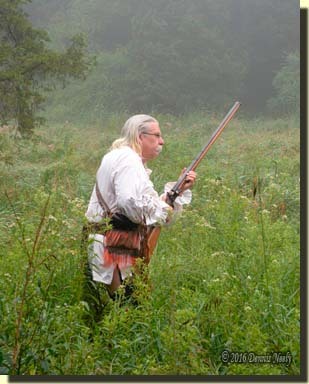 This entry was posted in Living History, Scenarios, Scouts and tagged Black powder hunting, Dennis Neely, historical trekking, Mountain Man, Native captive, North West trade gun, Northwest trade gun, trade gun, traditional black powder, traditional black powder hunting, traditional blackpowder, traditional blackpowder hunting, Traditional Woodsman. Bookmark the permalink. –Is the reason you do not charge your Firelock due to the risk of being accused a “Poacher in the King’s wood” by the local Constabulary? Great questions, and no right or wrong answer. First, to be historically correct, Old Turkey Feathers should be loaded at all times. Primary documentation weighs this out, time and time again. M’Coy’s circumstance is an exception, as I noted. To go on a short scout that only lasts 30 – 45 minutes in the off season, I usually do not load up, first to avoid explaining the loaded arm to a DNR officer (I’m sure the clothing would be a good defense), and second so I do not have to either pull the load or shoot it out and then clean the trade gun–modern time saving intrusion. The second point depends on the persona, time period and circumstance. Different writers offer different responses. In simple terms, it depends on the need for food versus the perceived element of danger that exists in that locale at that time. M’Coy and his family are not so lucky after making the same choice as Tanner. So in the end, it depends on your persona, his or her locale and the peace/war situation that exists in that location at that point in time. And all of this can or should be addressed when a traditional hunt’s scenario is first established. I’ll see if I can address this in a future post with the supporting documentation. With today’s growing open carry movement one could say that you are carrying you trade gun loaded for simple defense, same as 200 years ago. If your local state allows modern firearms to be carried for that purpose then any law enforcement should be even more accepting of a flintlock for the same purpose. Fortunately I live in a state where carrying firearms openly is common ( northwest Montana) especially when in the woods as bears, cougars and wolves are common even today.